The official name sounds a little technical – the Cone-Beam Computed Tomography system or (CBCT). But, to be fair, what it does is pretty technical. Thankfully, the experts at Overland Park Dental are here to explain this new technology, as well as show off just what it means for the health and comfort of our patients! 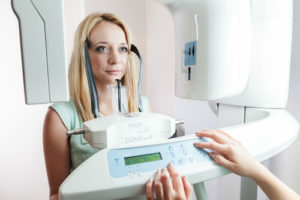 CBCT machines are designed to project a cone-shaped beam of X-rays, allowing the machine to provide a 3-D, holographic-type image, (as opposed to the two-dimensional information a conventional X-ray provides). This more detailed and complete scan helps dentists, orthodontists, and surgeons better evaluate, diagnose, and treat our patients. The CBCT system rotates around the patient’s head and captures data using a cone-shaped X-ray beam. It uses this date to reconstruct a three-dimensional image of the patient’s teeth, mouth, jaw, neck, ears, nose, and throat. This method provides extremely detailed 3-D views of the facial skeleton and teeth with with less distortion, more clarity, and unlimited perspectives compared to traditional X-rays. The CBCT’s 3-D holographic type images allow visualization of anything from your entire skull, to a single jaw or jaw joint, down to a single root canal within a tooth, and more. The great news for our patients is that all the information you need can often be obtained from one scan, and reformatted for different uses, for different areas or specialties of dentistry. A CBCT instrument takes multiple images (from 150 to 599 distinct views) that are digitally compiled into 3-D radiographic images. It is amazingly fast and accurate. Scanning time ranges between only 5 and 40 seconds. But what makes it so valuable is the fact that the information it collects is stored digitally, and a wide variety of images can be created from them, depending on what needs to be seen and studied. At Overland Park Dental, we strive to bring our patients the best technology available to make your visit the best it can be. When you need dental care, call us at (913) 647-8700 or (913) 341-2380.